Trying to decide what to read next? I have a new release for you to check out. 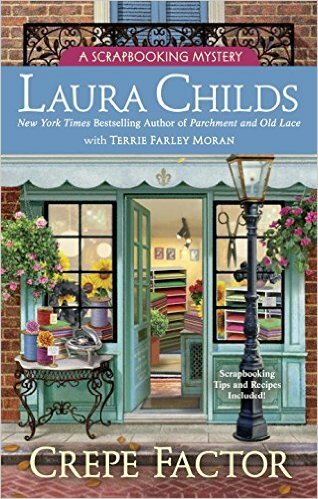 I just finished, Crepe Factor by Laura Childs (with Terrie Farley Moran). It is the perfect read for those cool October nights when you just want to curl up with a good book. This is the fourteenth book in the “Scrapbook Mystery Series” but the first one I’ve read. I am a fan of Laura’s “Tea Shop Mystery Series,” thus when I heard this book was coming out (and the next Tea Shop Mystery is still a ways off), I had to give it a try. The series follows scrapbook shop owner, Carmella Bertrand and her friend Eva as through life, love, and murder in New Orleans. In this book, the two witness a murder at the Winter Solace Festival and have to clear the name of their pal Quigg who becomes the number one suspect. This tone of these books is a little different than the Tea Shop Mysteries. I enjoyed main characters, Carmella and Ava. They were fun, quirky, and full of adventure. I appreciated that I could come into book fourteen as a new reader and not feel left behind in the series. I’m not a scrapbooker (or what I would define as crafty), so I wondered if I would feel left out of a good portion of the book’s story line, but that wasn’t the case. It was actually fun to see how many different things people bought within the shop and the different classes that Carmella taught to her customers. It even gave me a couple ideas for some simple DIY projects I may want to try at home. Overall it was a quick, fun, and entertaining read. Check it out and let me know what you think! Oh, and enter below to win your own copy. Thank you to Great Escapes Book Tours for a complimentary copy of this book in exchange for my honest review. Can’t wait to read Crepe Factor. New Orleans and the bayou is the perfect setting for a murder mystery. It was a great setting for the book. Makes me want to visit New Orleans sometime soon. Thanks for stopping by and reading the review!